An egress window allows safe exit from a basement living space. State and local building codes in New York require an egress window if you have a sleeping area in your basement, such as a bedroom. If you are building a new home, you are required to include an egress window or exit from your basement. If you are planning on finishing or remodeling your basement, ask Total Basement Finishing of Western NY about installing an egress. We are a certified installer of RockWell Egress Window Wells. They are IRC egress code compliant and come with a 10-year warranty. Safety - The egress window wells we install come with built-in steps to make it easy for your family or guests to escape from your basement in the event of an emergency. Added home value - Installing an egress window in your basement allows you to add a bedroom or extra living space to your home. Our window wells have a stone texture that looks and feels like real stone, adding curb appeal to your home. 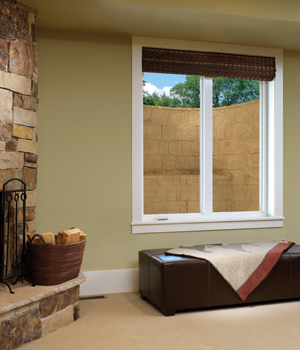 Comfort - An egress window adds more natural light and ventilation in your dark, drab basement. We offer free estimates on basement egress window installations in Greater Buffalo, Rochester. Call us at or click below to schedule your in-home consultation at no obligation. With proper installation, your basement egress windows will give you many years of safety, performance and peace of mind. They'll also make your basement feel bigger, brighter and more inviting. When combined with our other basement remodeling products, your finished basement will become one of your favorite areas of your home. Before starting your basement renovation project, contact Total Basement Finishing of Western NY to learn more about our basement egress windows and hassle-free installation process. Call today to request your free consultation! Our service area includes Buffalo, Rochester, Niagara Falls, Henrietta, Penfield, Clarence, North Tonawanda, Jamestown, Grand Island, Lockport and surrounding areas in New York.